The fierce Demi Leotard in Titanium is perfect for any dancer! 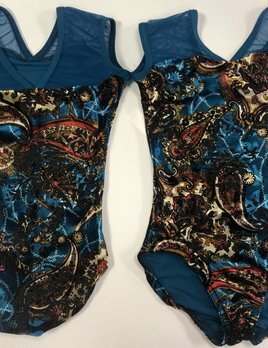 Feel sophisticated and elegant with our velvet Royal Paisley Leotard by BP Designs. There's only one batch of these made, so find your size and add it to your cart before they are gone forever! Did we mention it's velvet? A one time only leotard by BP Designs! Covered with gorgeous lace with an open back, this one is hard to pass up! Get it before it's gone forever! Stand out at your next dance class with this soft velvet leotard! This leotard features a collared top and scoop neck. This lace front, strappy back leotard is both elegant and will make you stand out in class!